A group of young footballers can wear their team colours with pride after receiving funding for a replacement kit. Cockerham Junior Football Club (CJFC), near Garstang was awarded £475 from the Westmorland Ltd Grants Fund in June this year towards a new U10’s football strip. The team have been playing in a strip that had been passed down from one of the older teams. 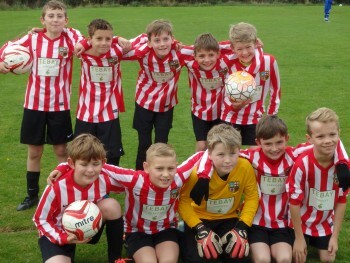 The new kit, which features the club’s red and white stripes, has provided a positive benefit to the children, giving them pride in their local club and themselves. They train at their home ground at Cockerham Village Hall under the supervision of experienced and qualified volunteer coaches. Westmorland Ltd regularly top up their fund held by Cumbria Community Foundation, who then allocate grants to local grassroots groups in the county.